Don’t have a huge marketing budget? Can’t afford to hire an SEO agency? Don’t worry. It’s possible to get started with SEO yourself. Two years ago, I was working for a startup trying to market an invention: a massage jacket. Being a startup, we didn’t have a large marketing budget. But, that wasn’t the worst part. 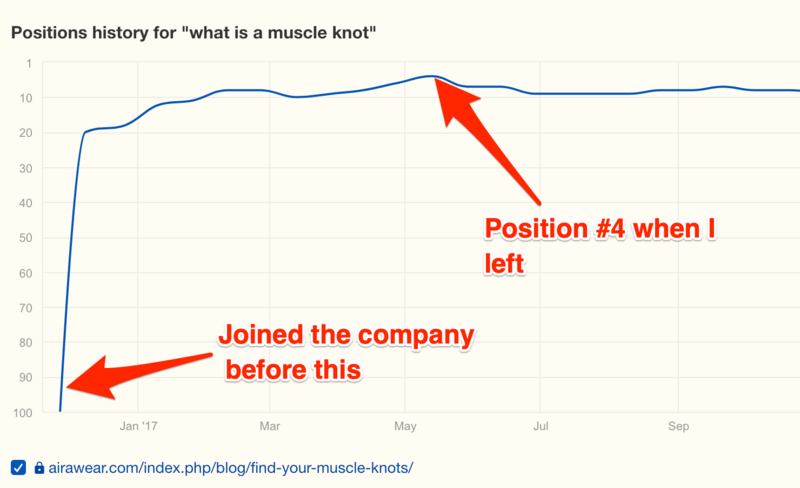 The worst part was that no‐one in the company was knowledgeable about marketing and SEO. So, they put me in charge of the marketing strategy. 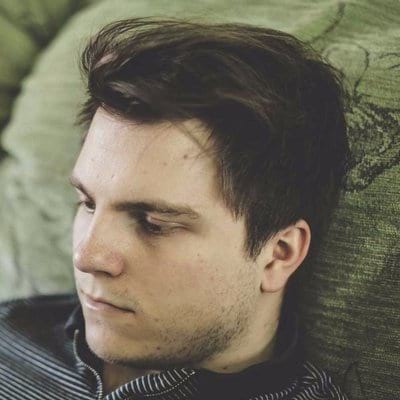 Knowing nothing and having no marketing dollars, I started reading a couple of SEO blogs. 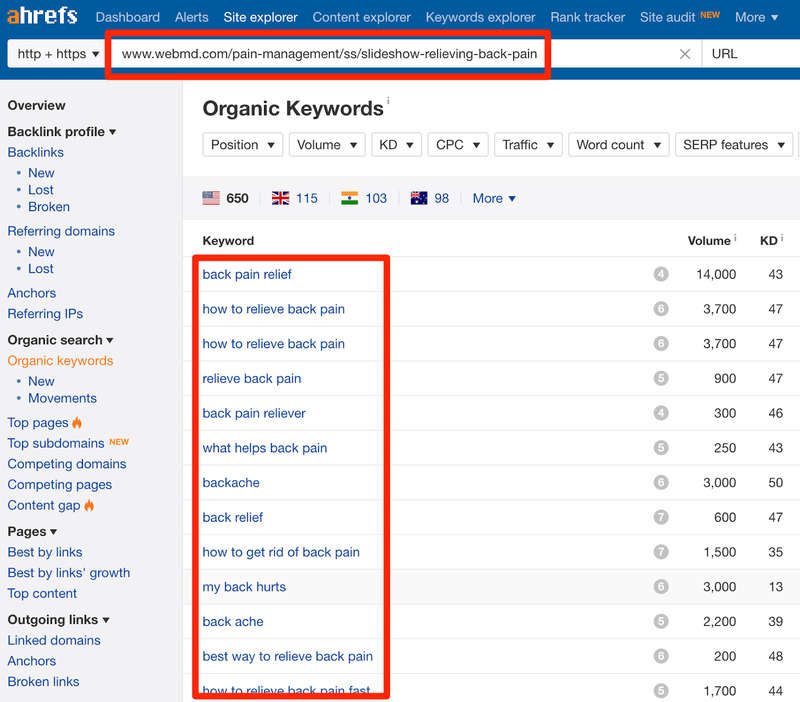 I then tried to implement some of the strategies they were talking about, and eventually managed to rank the site for a couple of keywords related to our product. Due to some business challenges, the company no longer exists. Now, I’m not telling you this story to impress you, but rather to impress upon you that with the right guidance, anyone can do SEO. You merely need the right strategy. In this step‐by‐step guide, you will learn everything you need to do SEO yourself. Before we begin, I recommend starting a website crawl in Ahrefs Site Audit tool. That will find errors on your site that need fixing. You won’t need the data until later, but since this will take some time to run, it’s better to get it started right away. Not an Ahrefs customer? No worries. It’s not an absolute requirement. You will still learn a lot from this guide even without doing this. Let’s see how you can execute some DIY SEO. Most SEO campaigns begin with keyword research. Essentially, keyword research is a SEO activity that involves finding the most popular words or phrases your target customers use when searching for what you do. Once you know what these words or phrases are, you can optimize your site to rank better for them. Your end goal? Make sure that every page on your site is optimized for the right keywords. Use the Scraper Chrome extension to extract these. Here’s the XPath you need: //a[contains(@href,’yourdomain.com')]. Just make sure to replace ‘yourdomain.com’ with your actual domain. Or if you’re using WordPress, you could use a plugin like Export All URLs to extract all your pages. A “head” keyword is the primary keyword for which you want to optimize the page. To start, you can piggyback off the research of your competitors. Look at the page you’re trying to optimize. Guess the best possible keyword. Then, type your hunch into Google and look at the title tags. This seems like an appropriate keyword to target. However, this isn’t the most foolproof way of doing things as you can’t tell how much search volume or traffic potential a keyword has. 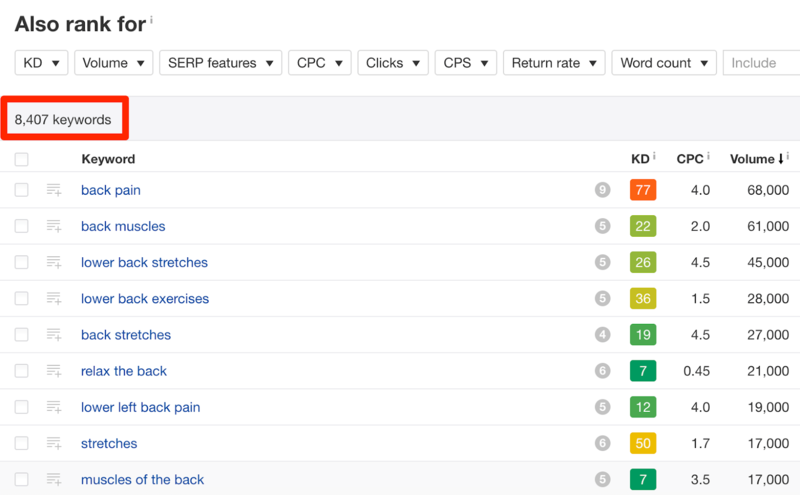 So a better method is to take a look at the keywords for which you already rank. 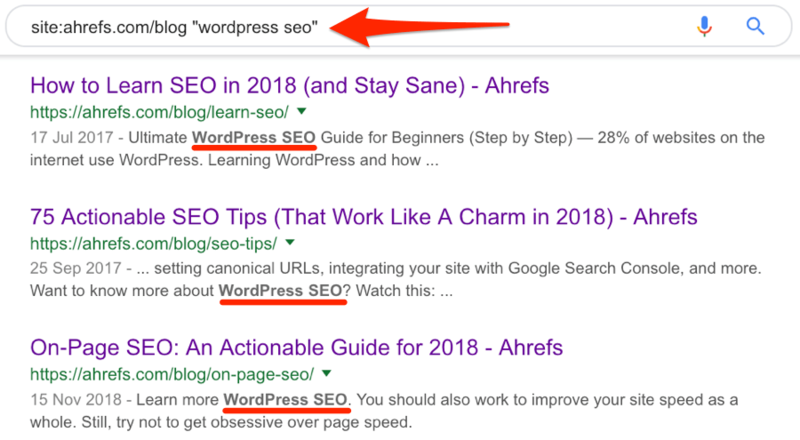 You can do this in Google Search Console (here’s a guide that shows you how to set it up) or using the Organic keywords report in Ahrefs Site Explorer. Don’t have your site set up yet? Paste in a similar, competing page and look at the keywords for which it ranks. Choose the one that looks to be the best fit. Next, take that keyword, look it up in Keywords Explorer, then check the Parent topic. This tells you if you can rank for your chosen keyword while simultaneously targeting a higher volume term. 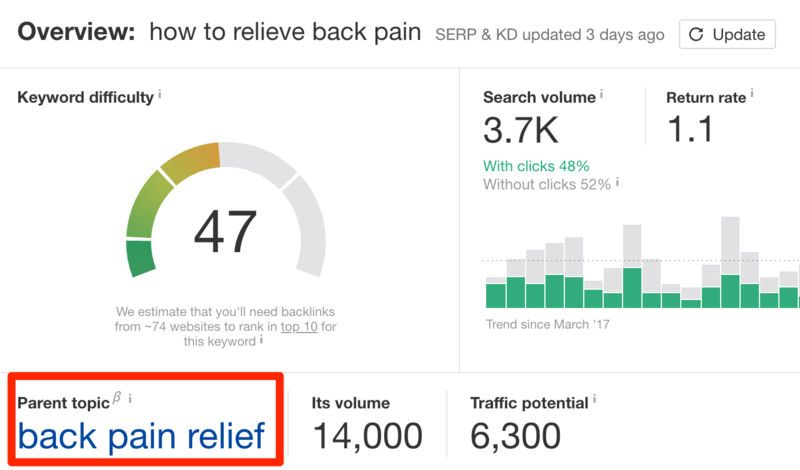 For example, if I enter “how to relieve back pain,” I can see that it suggests “back pain relief” as the Parent topic. This seems like an appropriate head keyword to target. Long‐tail keywords are related keywords for which your page could also rank. In one of our studies, we’ve found that the average #1 ranking page will also rank for ~1,000 other relevant keywords. So, not only should you optimize your page for a “head” term, but you should also try to optimize it for various long‐tail keywords. 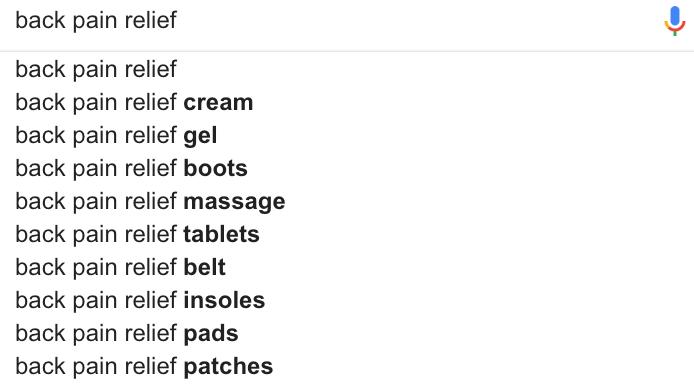 One way to find long‐tail variations is to look at Google Autocomplete suggestions. This will give you more than enough ideas to get started. If you want to see a broader range of long‐tail variations, look up any of the top‐ranking pages for your head term in Ahrefs Site Explorer. 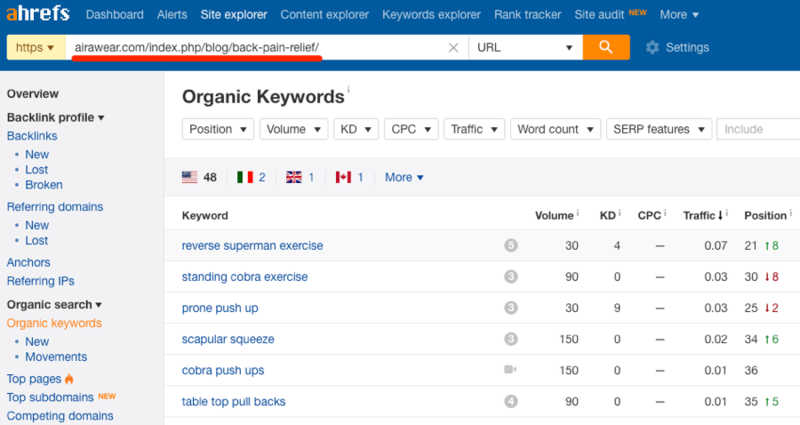 Go to the Organic keywords report. Here, you will see all the keywords that page is ranking for, and voila, your long‐tail variations. You can take this a step further by taking the top 3–4 ranking pages and doing a Content Gap analysis. This will surface all the common keywords these pages are ranking for, which you can then include as long‐tail variations. Alternatively, you can use the Also rank for report in Keywords Explorer to find long‐tail variations you may want to include. On‐page SEO is the process of optimizing a website’s on‐page elements (such as the content, structure, code, etc.) to help it rank better in Google. Most people think that boils down to the number of times they mention their keyword on the page. That is wrong. Keyword stuffing—the practice of unnaturally shoehorning keywords where they don’t belong for SEO purposes—died well over a decade ago. Nowadays, Google can understand synonyms and semantically‐related words. Do you know how many times this page mentions the keyword “best break dance songs”? Zero. Yet Google still understands that this is a relevant search result. Ready to stop optimizing your page like it’s 1999? Follow the tips below. Getting to page 1 is only half the battle won. The other half is convincing the searcher to click on your page over the other results. How can you do this? Write title tags and descriptions that compel the searcher to click. Plus, there is evidence that a higher click‐through‐rate (CTR) can have a positive effect on rankings. 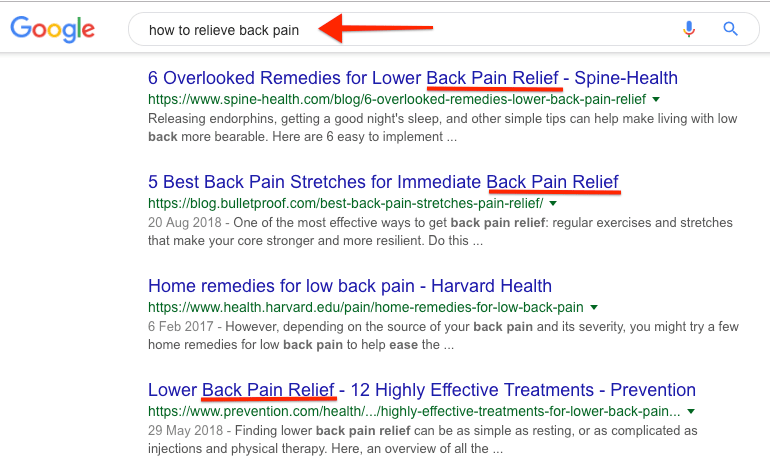 Keep them short: Google starts truncating both title tags and meta descriptions after a certain length. 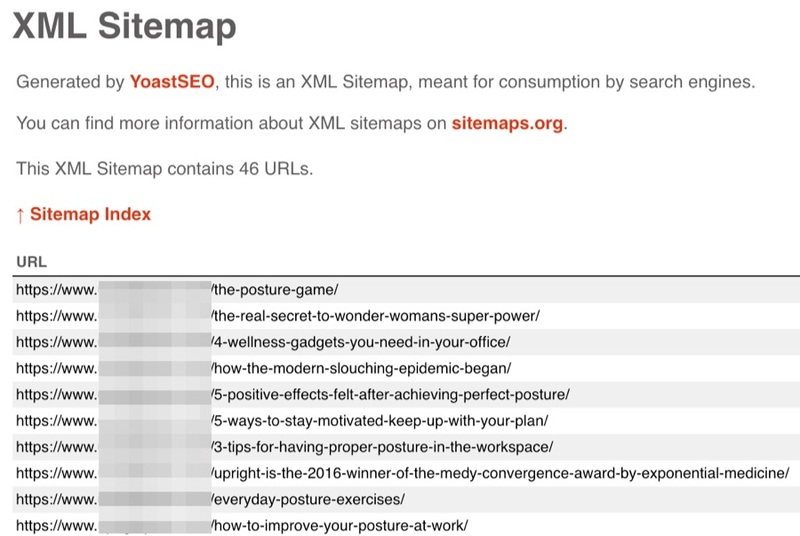 Use this SERP simulator to check that you’re within the boundaries. Use “power” words: Awesome. Powerful. Proven. Etc. These are all words that evoke an emotional response from readers. See more power words here. Include your target keyword: Not an absolute requirement. Sometimes it doesn’t make sense to do this. In general, however, this is another good way to show the user that your page is the most relevant result for their search. To learn more about writing the perfect title tag, check out our 4‐step process. A descriptive URL is a URL that tells you what to expect from a page. It doesn’t take a genius to work out that this page is about local SEO—it’s immediately apparent from the URL alone. This makes the result more clickable. That’s because users are more almost certainly more likely to click on a result that demonstrates what they should expect from the page in no uncertain terms. 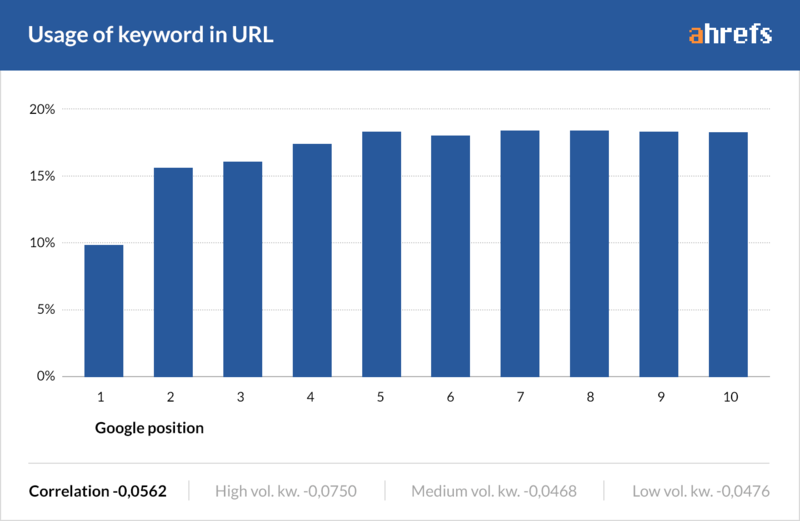 Further, in our previous study of two million keywords, we found that there was a slight correlation between higher rankings and keywords in the URL. The age‐old correlation vs. causation debate aside, there’s one other reason why it makes logical sense to do this: backlinks that use the naked URL as the anchor text will include your target keyword. Internal links connect pages on your site to each other. 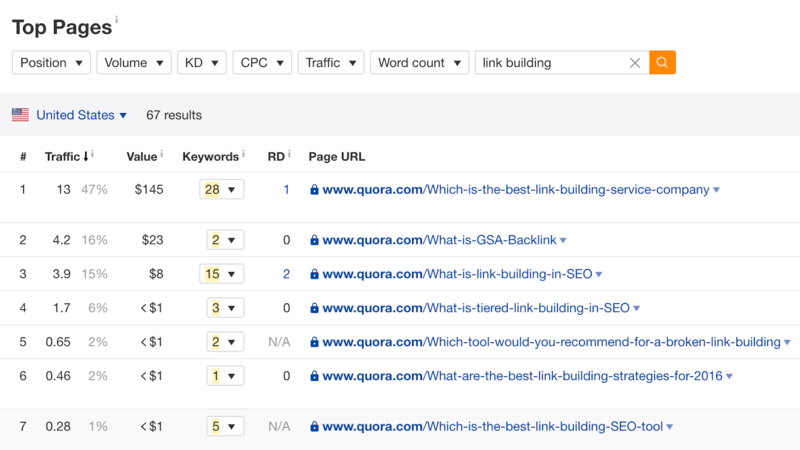 For example, this is an internal link to our long‐tail keywords guide. Internal links help to transfer PageRank and boost the “authority” of specific pages on your website. Not only that, but Google also looks at internal link anchor text to help further their understanding of the page. Unfortunately, most sites neglect this. They focus on creating new pages but forget to link them together. You have a page to which you want to link. It has a target keyword. 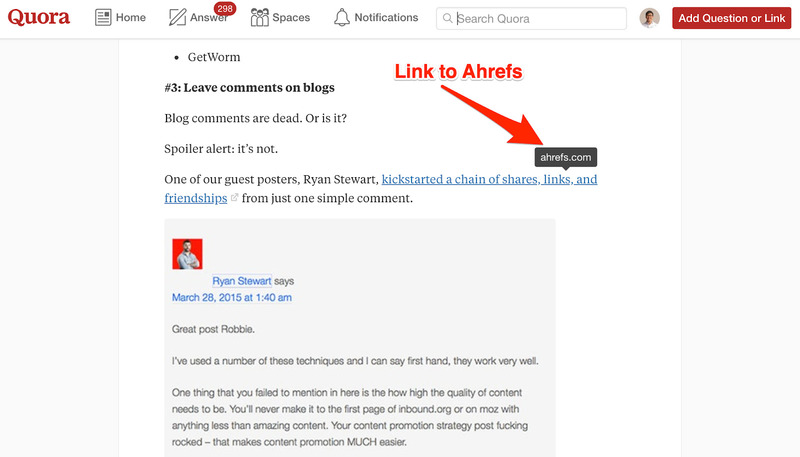 Next, quickly run through these pages and find those where it makes sense for you to add internal links. 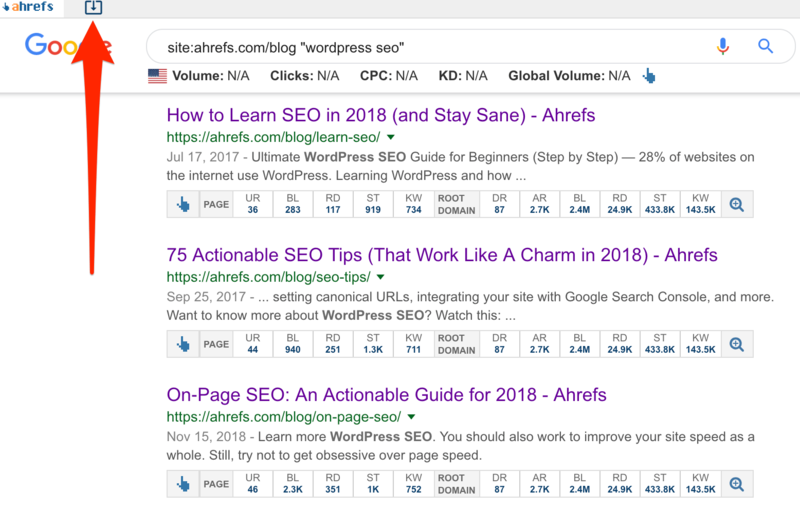 If you have access to the Ahrefs’ SEO Toolbar, you can download all of these pages from the SERP alongside useful SEO metrics. Then, in the CSV file, you quickly easily sort them by organic traffic or URL Rating (UR) to find the most powerful pages on your site where you can add internal links. If you started a crawl at the start of this post and you have a relatively small site, it should now have finished. The good news: Site Audit will point out all the URLs on your site facing any issues. Didn’t set up a crawl using Site Audit? Fret not. Below, I cover two of the most common technical issues faced by small business owners. See this little lock here? The site is secure through the use of the HTTPS protocol. This means that the website is encrypted: only your computer and web server can see the data transmitted from your browser. Technical jargon aside, why should you care? Security is essential. Google said so. In 2014, Google announced that HTTPS is a ranking factor. While there is only a slight ranking boost, you should still make sure that you are using HTTPS sitewide. To learn how to set up HTTPS properly, read this guide. Don’t you hate it when you’re trying to access a website, and it takes forever to load? So do your customers. If you want to create a smooth visitor experience, you need to make sure your site loads fast. Plus, there’s extra incentive for you too. As of 2010, Google has said that page speed is a ranking factor. This is especially important now that Google has rolled out mobile‐first indexing. 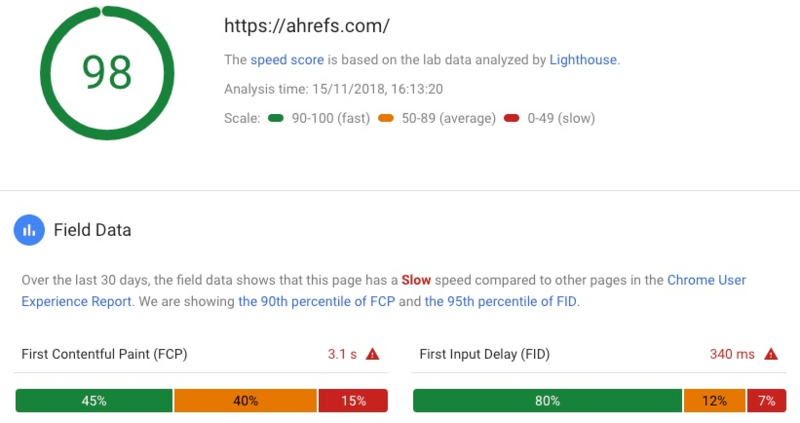 But if you didn’t run a crawl, you can also use Google’s PageSpeed Insights tool to check your speed (it’s free!). However, with Google PageSpeed Insights, you’ll have to check the speed of each page individually. It’s not a big deal if you have a small site, but it can still be pretty time‐consuming. Choose the right hosting. The hosting you use (shared vs. dedicated server) matters for your site speed. Here’s a guide that compares the effectiveness of different WordPress hosts. Reduce image sizes. If you’re using WordPress, you can install a plugin called ShortPixel. ShortPixel will automatically compress your uploaded images without compromising their quality. Learn more about this in our full guide to image SEO. Enable browser caching. When you enable browser caching, your visitors can store the elements of your page onto their hard drive. This in turns allows them to load your page without sending another HTTP request to your server when they next visit (i.e., faster loading!). With WordPress, you can use a plugin called W3 Total Cache to enable caching easily. Not using WordPress? Check out this guide on more tips on how to speed up your website. Links are important. They’re one of Google’s top 3 ranking factors. This is the reason why a big part of SEO is about link building. It’s all about using creative strategies to get other sites to add a link back to yours. There are plenty of proven link building tactics you can use to get more backlinks to your site. Community sites are places where your target audience hangs out to discuss topics, trade tips and ask for help. These are places like forums, Reddit, Quora, Facebook groups and so on. Participate in the community, befriend others, deliver value and you’ll get a chance to promote your website. Take note that the links you build here are usually nofollowed. But, that’s not necessarily a bad thing. Promoting on these sites increases exposure. More eyeballs can indirectly lead to more links. If your competitors have more links than you, don’t worry! You can replicate them. You merely have to find out who’s linking to them (but not you) and find a way to replicate those links. To do precisely this, you can use a tool called Link Intersect. All that’s left to do is to analyze the results and find out the reason why they linked to your competitors but not you. Then, reach out and see if you can secure the link for yourself! 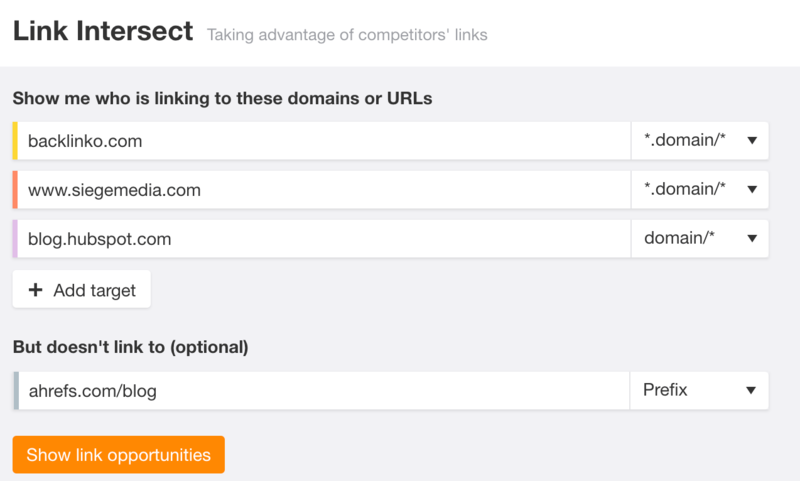 Read our full guide to replicating your competitors’ backlinks to learn more ways to do this. These two strategies are merely the tip of the iceberg when it comes to link building. If you’re looking for more tactics, here’s the full list of link building strategies you can implement. What you’ve done so far is to optimize your existing site for better rankings. Generally speaking, the more pages you have, the more keywords for which you can rank. So, if you want more search traffic, you need to create more pages that rank. How? These are search queries where the user is looking for more information about a particular topic. Essentially, the idea is to create content that ranks for these search queries, which you can eventually funnel into sales. One look at the top ranking pages shows us that users searching for this term are not looking to buy anything. They’re looking for methods, tips, and remedies on how to deliver back pain relief. 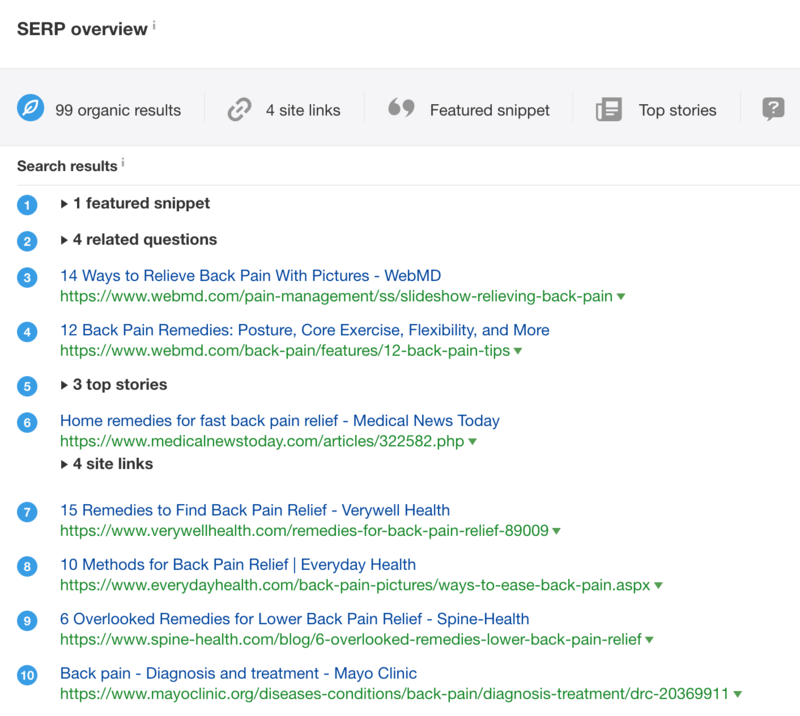 SERP Overview for “how to relieve back pain” in Keywords’ Explorer showing informational results. Create a piece of content that matches search intent. Then, in the article, you can either directly promote your product or gently nudge them into the next stage of the funnel by getting them to sign up for your newsletter. 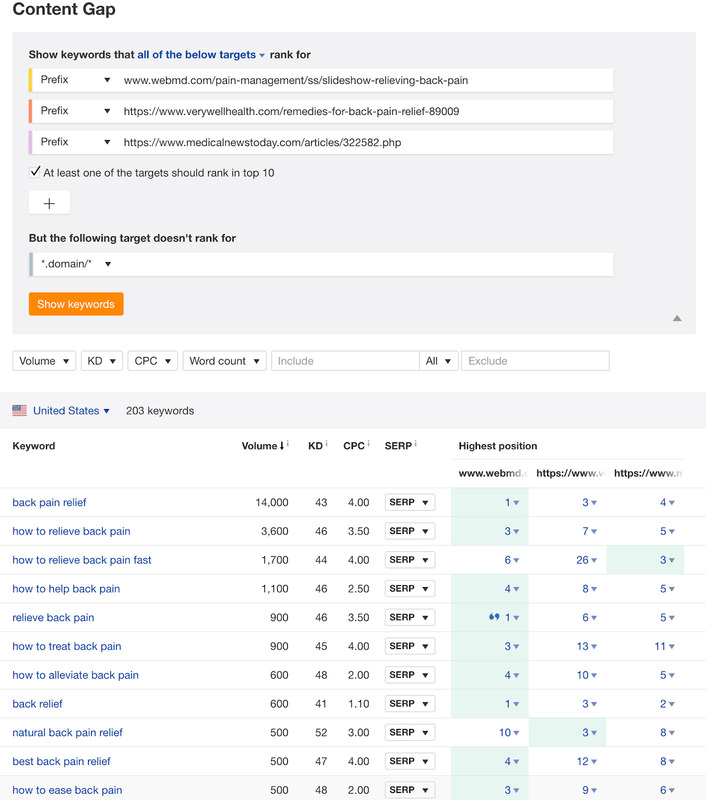 Perform keyword research, find a head term you wish to target (along with long‐tail variations), do on‐page SEO, make sure there are no technical issues and build some links. If you want to learn how we’ve executed our content marketing strategy to get thousands of customers, you can read the full step‐by‐step guide here. This simple DIY SEO guide covers the fundamentals of SEO. You can follow this guide over and over again to optimize your site and start ranking for meaningful and relevant keywords. More success in the search engines = more traffic, and potentially sales. A nice byproduct of having more revenue coming into your business is that you’ll have more money to invest in SEO. You may even consider hiring an agency or consultant to take things to the next level. Or, if you prefer to continue down the DIY route, you can learn about more tactics and strategies on our blog, YouTube channel, and Academy.